The skill of negotiation belongs in every flea market shopper’s pocket. Whether you are trying to decorate on a budget, have limited cash or just like the thrill of a deal, negotiating the price at flea markets a common practice. Follow this advice to help bring home more treasures and get more bang for your buck from your next shopping venture. Negotiating can help you stretch your flea market dollar as well as score great deals on one-of-a-kind treasures. 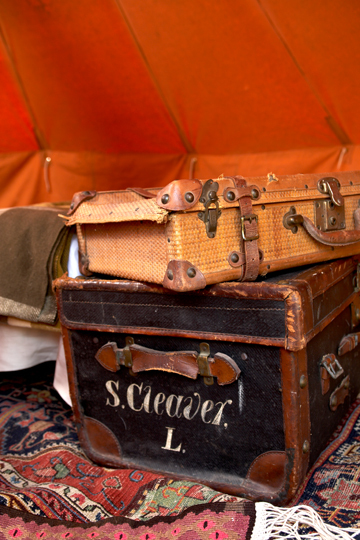 Try bargaining for two things at a time from a seller, such as these two trunks, as they will be less likely to turn down an offer on two sales. Oh, the joy of trying to get what you want. In some cultures it’s common to negotiate before settling on a price for anything and everything; but for most of us, that skill doesn’t come naturally. The good news is, the art of negotiation can be learned. If you try just a few of these ideas, you’ll discover your bargain-hunter persona and be able to express it with honor. Gourevitch and his partners run the Flea Market Insider’s Tour in Paris, a “two-hour stroll through the largest flea market in the world,” where guests discover hidden market gems and learn negotiation techniques. “Never put the word of the merchant in doubt or you will humiliate them, upset them and possibly get yourself kicked out of the shop,” Gourevitch says. Market Warriors follows four antique pickers on a treasure hunt to find antiques and vintage valuables throughout the U.S., to sell for profit at auction. Market Warrior Kevin Bruneau advises to use cash to assist in getting the best deals. “Cash will usually buy something for at least 10 percent less than any other form of payment. Bring $100 bills…dealers love them. Flashing a few can get you even a better deal,” he says. Lidy Baars of French Garden House travels to European markets every year to replenish her fine wares and confirms the importance of common sense. “Be courteous,” Baars says. “Most dealers price their items with some negotiating room. I usually decide for myself what a certain item is worth to me before I ask ‘What is your best price?’ and then I smile.” Plus, if you buy several items “they’ll usually be amenable to a group discount.” Sally Schwartz, founder of Randolph Street Market in Chicago, Illinois concurs. “Always ask ‘What’s your best price?’ or ‘Can you do any better on the price?” and have cash. “It’s the quickest transaction and less cumbersome for the vendor,” Schwartz says. Anything that helps you move on to the next great find is good for you too. This entry was posted in Decor Inspiration and tagged antique, Antiques, budget, Collectibles, collecting, flea market, flea market bargaining advice, Flea Market DÃ©cor, flea market finds, Flea Market Insider, flea market shopping tips, flea marketing, how to, vintage, vintage finds, vintage style by Flea Market Decor. Bookmark the permalink.